On January 1st we have a tendency to reflect upon the previous year and think about what we can do differently to make the new year better. I used to be one of those people who made New Years resolutions. I had a 0% success rate of keeping my resolutions, so 3 years ago, I decided to take the One Word Challenge. My One Word for 2018 is: Connect. This year, I want to be more intentional to connect with God and the people around me. While we all have acquaintances, I believe God puts specific people in our lives that He wants us to connect with a on a deeper level – to move past the “small talk” and to truly get to know one another. These are the relationships that I want to invest more time in. This isn’t easy, I believe it’s a worthwhile investment. In order to connect with others on a deeper level, I first need to connect with the One who placed them in my life. Because of that, I’m intentionally setting aside time each day to read the Bible. I plan on reading through the entire Bible in a year (something I’ve never done) using The Bible Project and the Read Scripture App . Thanks to technology, we can connect with others in many ways, but I still believe the best way to connect with someone is through face-to-face, real life interaction. If you’re an introvert like me, you know that this takes a lot of energy. Because of this, I’ve already started praying and asking God who He wants me to connect with on a deeper level. Our time is valuable, and I want to be more intentional about who I invest it in. I look forward to connecting more with God and others. 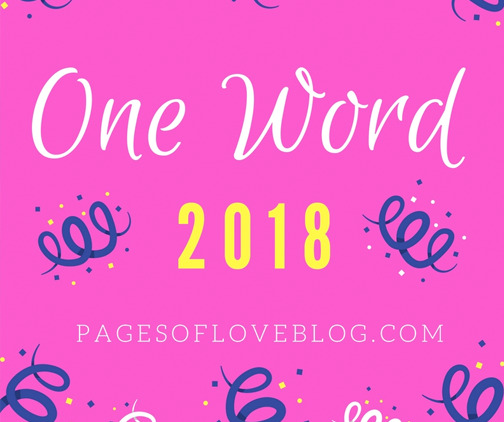 What is your One Word for 2018?